I love the combo of vertical and horizontal stripes! So cute and summery! You look adorable- that dress is perfect for beating the heat! And yay - I'm so glad you got the wedges!! The look great!! Yes girl...the heat is insane this summer! We've had temps over 105, it makes being outside miserable! This dress looks amazing on you, and I love that the stripes go in two different directions. I see you got those pretty shoes for your birthday...yay! Love this look! Looks put together but so comfy too! What a perfect summer dress! LOVE! I am always on the hunt for easy dresses that you can just throw on. Great post! LOVE that gorgeous dress--it's perfection paired with those shoes! Such an effortless summer look! I love the combination of vertical and horizontal stripes, such a fun piece! This dress is so cute! It is getting really hot here this week too, and I've been searching for cool dresses. It's the best way to beat this July heat! Absolutely love this dress! Hope you had a wonderful birthday!! I would be so sweaty and gross looking in that heat but you look amazing!!! You'd never know it was so hot!! ;) Love this dress on you, adorable as always! These photos are just gorgeous! I need that dress. Love this dress so much...on you, it's so gorgeous! And those wedges...STOPPPP..amazing! Nice styling dress and I love those heels. This dress is so perfect on you and I'm OBSESSED with your shoes!!! Beautiful! Love this classic dress - so perfect for summer! Love this dress. And the location looks beautiful. Cute shoes and I love the neckline of this dress...so pretty and no kidding the heat is almost unbearable here!! I'm melting on my lunch breaks when I leave the office. Gorgeous dress! I adore the mismatched stripes! Love this dress on you! Such a cute and chic look! The perfect summer outfit... and those shoes are to dieee for! It is so freaking hot and humid in NC I am avoiding pants and staying in dresses at all times! Why is it so freaking hot?!? This time of the year I wonder why I live in FL haha! Obsessed with this dress! The stripes and the neckline is so cute! The last thing that I want to wear when it's hot outside is something that's super tight. I can't stand it when it's hot and sticky outside! That dress is so cute, and like you said, I think that it's awesome that it can be dressed up and down based on the accessories chosen. I can see why you chose to wear it again for the Fourth! Amazing dress! It is perfect for the type of weather you've got going on right now. That whole 95 degrees at 9am thing is a pain. I woke up and went outside at 6am on Monday morning... 80 degrees but a heat index of 94. What?! Too hot! 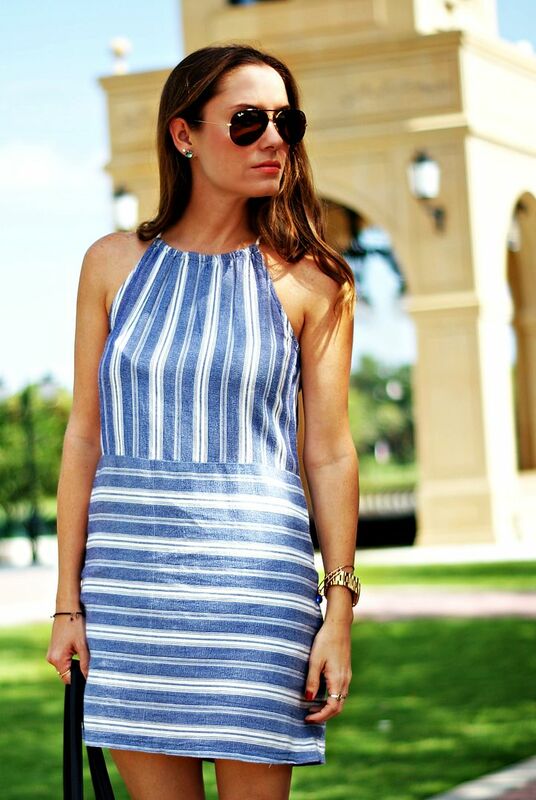 I'm obsessed with stripes and that neckline, so that dress is perfection! I have no idea how you guys deal with the heat - it's mid to upper 90's here this week and I cannot take it, ha! 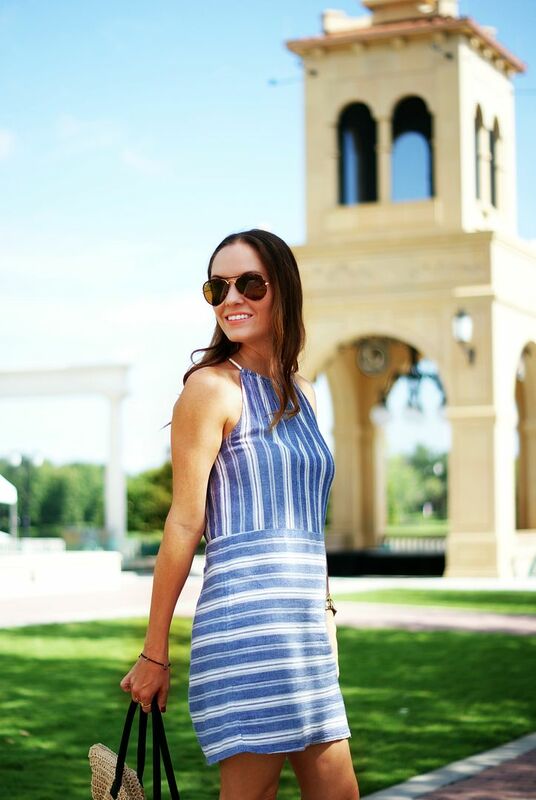 Love this look - blue stripes are the best! I'm so in love with this whole look on you! That dress sounds perfect for the heat. I love that dress! It looks so cool and comfortable! We are having similar weather, it is the worst! SUCH a cute dress and SUCH a gorgeous gal! Seriously, friend- these pictures belong in a freakin' ad, for real! Cute dress (and shoes, of course!). Hope you had a fabulous birthday! I'm definitely loving the short week, too- a Thursday that only feels like a Wednesday? I'm in. 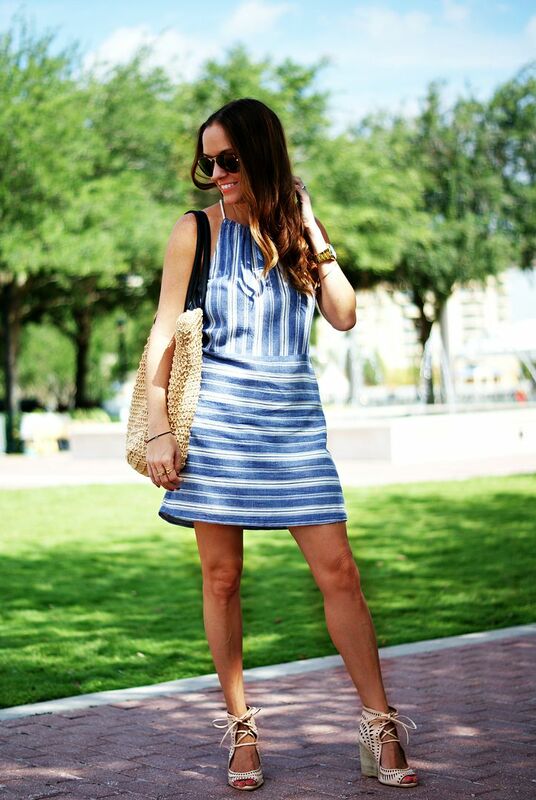 Love the striped dress, babe- and those neutral wedges are awesome! This dress is SO cute and I’m loving those heels! How cute do you look! I am obsessing over that dress on you! And those wedges are legit so fab! So cute and you don't even look like you're hot at all! I need all of your tips and tricks for staying cool in this heat, I am so not used to it! Blue and white stripes?! One of my favorite combos! Especially with those wedges. oh my goodness.. those shoes! so gorgeous. and this dress is just fabulous. that neckline is so flattering!